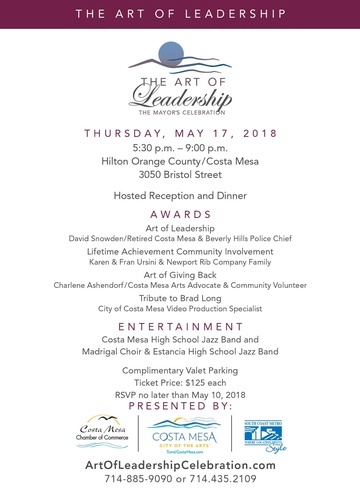 The Art of Leadership is presented by the South Coast Metro Alliance with the Costa Mesa Chamber. Each partner is dedicated to communicating the necessity of arts education as a critical component of a complete and successful education. They have joined with the mayor and the City of Costa Mesa in efforts to provide visual and performing arts education programs in our schools and to a fundraising opportunity that, this year, will support these programs in Costa Mesa High School and Estancia High School, Save Our Youth “SOY” Arts & Dance Programs and the Segerstrom Center’s Summer in the Center and South Coast Repertory Children's Conservatory.